At Data Projections, current bread and butter installs include infrastructure integration, mobile integration, service contracts, and huddle spaces. After all the sugarcoated holiday fanfare, now’s the time to consider your 2014 bread and butter, those niche installations you count on to help keep your bottom line happy. But is there really such a thing as an everyday install? More likely, your projects are ever changing, evolving with technology advances and your clients’ growing needs. For Per Forsberg, president of Audio Architects, the phenomenal growth and increased presence of technology has led him to believe that although there is no such project as an everyday install, there will always be a unique comfort zone for each contractor based on their history in the industry. Solutions such as the huddle room enable Data Projections to standardize on specific types of equipment and manufacturers, he noted, making several aspects of project management and installation more efficient which ultimately helps the bottom line. The demand for this infrastructure and the move of the customer from the facilities department to IT has also created an increase in demand for better service agreements— software as a service, platform as a service, and larger preventative maintenance contracts. What is the first step an AV integrator needs to take to add standing desks to their offerings? The health issues related to spending prolonged periods sitting at a desk have been widely publicized, but they are not only problems in offices, but also in conference rooms, classrooms, and training facilities. Sit to Stand desks are becoming increasingly popular for a wide range of applications. When engaging a corporate or education customer in a new AV project, asking the question of whether they have considered a sit to stand desk as part of the solution is one way to get a happier client, and expand your revenue. 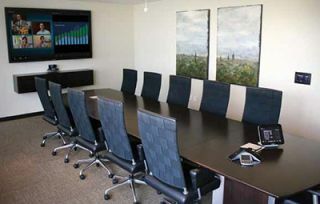 A conference room table can be replaced with multiple individual sit to stand desks, such as the WorkFit-D sold by Ergotron. If a custom work surface is required, the WorkFit-B has a fluid sit to stand lift mechanism that can be bolted onto a custom work surface. Adjustable desks can make a public area more dynamic and engaging, in addition to creating a healthier environment. What is the first step an AV integrator needs to take to add sound masking to their offerings? The first step an AV Integrator needs to take to add sound masking to their offering is to research the available options and determine the best fit for the types of solutions they provide to their clients. There is no doubt that sound masking effects every employee within a facility by changing the environment that they work in. However, competitive modeling positions different sound masking companies within the market. There are price players. There are proprietary systems. There are networked systems. Some companies offer full lines and other companies piece parts together in an attempt to meet all of the criteria of the client. What service does the AV Integrator want to provide to their client? By understanding who the AV Integrator is or wants to be can determine the type of sound masking system they add to their portfolio of products. After determining who they are and what masking company they want to work with, the AV Integrator merely needs to extend a hand and ask. Most sound masking companies are thrilled to work with AV Integrators and get them on board as an extension of their business. As mentioned before, sound masking is not overly complex. However, great masking companies provide a range of services including training, design, and technical support. What do their resources look like online and over-the-phone? What is the first step an AV integrator needs to take to add shades or lighting to their offerings? It’s all about talking to your client/potential client. When a project is proposed, take a look at the project schematics, talk to them about what they are doing and what their needs are, and learn more about their pain points. Usually the customer is working with our integrators on the AV portion of their job, but there typically is a separate budget or plan for lighting and environmental systems. Talk to them about the entire project and discuss how you can provide the AV infrastructure, as well as the environmental/lighting control solutions for building-wide integration. It is very simple to add lighting and shading control to a project once the AV solution is installed. The processor is the brain of the system and offers the flexibility to add systems at any time. When an integrator walks into a boardroom to do control, he should ask the customer about the rest of the building. Why walk away after completing one room? Ask questions and bring awareness to what else is possible. The first step to get started on these new offerings is to work with manufacturer partners like Crestron that offer extensive professional development classes and tools to make it easier for integrators to get started in these new areas. Topics such as “Understanding the Basics of Lighting Controls,” “Lighting Commissioning and Programming,” and “Shade Installations” will help the integrator become familiar with the systems and opportunities available to them by offering these solutions to their customer as an add on. With the exploding popularity of LED lighting, the lighting category has become a hot one! Every business embraces the idea of saving money, and moving your customers from incandescent to LED lighting can do a bunch of that. Think about being able to offer your customers 80 percent savings over incandescent lighting—not too shabby. Job number one is to get comfortable with what you’re selling. Learning what the parameters are that define bulb performance will do that for you. In other words, a little education and a little common sense will help you to understand why you’d never put a narrow spot in a place that requires a wide flood. The fact is that due to the rapidly growing range of LEDs on the market, something as simple as needing to replace a 60-watt bulb has led to an era in which the specs have a high degree of precision. There is just enough confusion when it comes to a customer trying to buy a product off the shelf, that makes the demand for a lighting specialist more popular—and that specialist could be you. The good news is that it’s not hard—it’s just different. A good recommendation would be to invest in a range of LED lighting samples, different brands, bulb sizes, color temperatures, etc. As you get more familiar with LED lighting, you’ll also find that LED upgrades give the client a chance to do a little bit of a facelift. Colors can look better, floor surfaces can be better lit, and shadows from the use of the wrong kinds of bulbs can be eliminated. And guess what, your clients will be stunned at the difference it can make. There are suppliers who can help with the educational process (I speak from experience) and that’s the kick-start you’ll need to add this cool new revenue stream. With all the other disciplines that you provide to improve the environments you are working in, this one that’s been right in front of you may be the easiest to add.